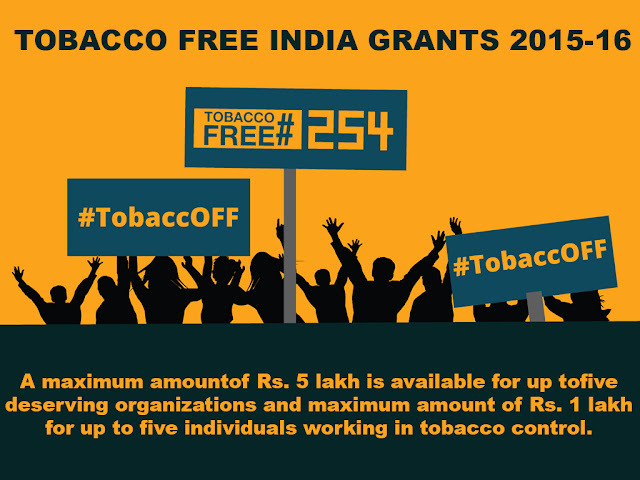 NON-FCRA PROJECT: TOBACCO FREE INDIA GRANTS 2015-16! The Narotam Sekhsaria Foundation partners with charitable and philanthropic initiatives and developmental enterprises by funding and mentoring programs that enable better access to healthcare, governance, education, livelihoods, and art and culture. Its focus areas include promoting excellence among individuals, improving the quality of life for socially and economically disadvantaged communities, and promoting and protecting Indian traditions. Recognizing the health hazards of tobacco abuse, the Foundation lays equal emphasis on cancer prevention. One of the key interventions is based on support towards tobacco control initiatives. Towards this, every year, the Foundation provides grants to organizations and individuals for their commendable work in the area of tobacco control. Reduce the prevalence of tobacco among stakeholders like teachers, Sarpanch, MPHW, police and Ngo, and partner NGO’s employees etc. Increase in awareness level of the teachers, students, NGOs, health workers police on ill effects of tobacco usage and COTPA. Effective implementation of section 4, 5 and 6 A and B and rules of COTPA there under. Making tobacco free schools and villages as per the guideline of Salaam Mumbai Foundation based on CBSE guideline. Support or conduct Training of Trainers for Master Trainers and trainings for Block Education Officer, Block level teachers etc in awareness and advocacy for tobacco control. Conduct sensitization meetings with Police, FDA, PHC, Sarpanch etc. A maximum amountof Rs. 5 lakh is available for up tofive deserving organizations and maximum amount of Rs. 1 lakh for up to five individuals working in tobacco control. The focus is on organisations working in rural and small town areas (population less than 1 million). Organisations working with the government at advocacy level on implementation of COTPA at district level will be highly preferred. Previous grantees can reapply only after completing three years from the year they received the grant. Any incomplete application will be rejected. Special preference will be given to Community Health Workers, Sarpanch and a local leader from rural communities and small town population. Demonstrate innovative, motivational leadership impacting communities towards tobacco control. Minimum of three years of past experience in the field of tobacco control. Previous awardees can reapply only after completing three years from the year they received the award.